ETTSI Incentive Premiums today announced its new Salon Incentives Rebate Certificate, a multipurpose marketing tool to promote and reward customer loyalty in beauty salons. The Salon Incentives Certificate was designed to meet several needs in promoting repeat services and products sales in salons. Product manufacturers and distributors can include these certificates as part of a buy in of a new product line or to increase their presence and broaden the selection of their product offerings in existing accounts. I personally would use these certificates to reward my clients who have been loyal to me and referred their friends and relatives, but. ETTSI Incentive Premiums, a licensed and bonded seller of travel for more than 18 years and a pioneer in the travel incentives industry, today announced its new Salon Incentives Rebate Certificate, a multipurpose marketing tool to promote and reward customer loyalty in beauty salons. The Salon Incentives Certificate was designed to meet several needs in promoting repeat services and products sales in salons. Product manufacturers and distributors can include these certificates as part of a buy in of a new product line or to increase their presence and broaden the selection of their product offerings in existing accounts. Salons can purchase these certificates to use as referral rewards, first time customer incentives, and customer loyalty rewards as well. The recipient of the certificate can redeem one of 10 - $10 rebate coupons per salon visit on a service fee or product charge of $20 or more for a total of $100 over 10 visits. 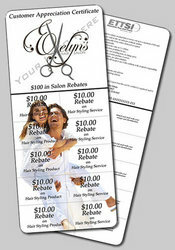 There is no time limit to redeem the coupons and certificates can only be redeemed on purchases made at the issuing salon. ETTSI handles all the processing of the rebates and insures that the certificate holder only receives rebates on charges from the salon who gave out the certificate. The salon or product distributor is only charged for the cost of the certificate which is far below the face value of $100. Included as a bonus with every Salon Incentives Certificate is the salon’s choice of one of ETTSI’s Promo Series Travel Certificates. Fly Free America, Passage to Fun, or Vacation of a Lifetime are the most popular but several other travel programs are also available. For additional information about ETTSI and their broad range of incentive premiums products, you can contact Frank Bertalli at PR@ETTSI.com or call 1-866-224-9650. ETTSI is registered in the states of Florida, California and Nevada as a Seller of Travel. FL#ST22752, CA#ST2065118-40, NV#2006-0132, offering a full service travel agency as well as many travel and cruise packages in the form of travel certificates. For more than 18 years ETTSI has lead the sales incentives industry with unique programs and products always striving to meet the needs and exceed the expectations of the sales organizations they serve. Through the sale of their certificates, ETTSI provides travel accommodations to 1000's of travelers each year garnering them preferred pricing and preferences with airlines, motels, and many other travel related services. Please visit http://www.ETTSI.com for more information about the company and its products and services.